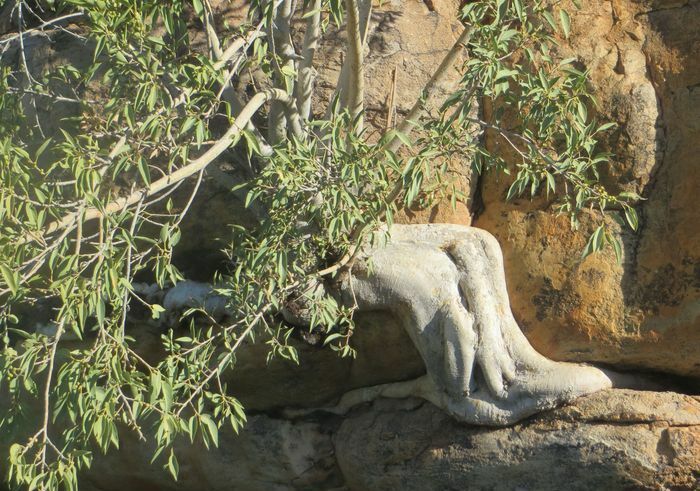 The Namaqua rock fig represents the largest and tallest indigenous tree from Namaqualand. It is an ascending, rock-splitting tree confined to rock outcrops, when mature, often with drooping branches and small reddish brown figs. Medium-sized to large, spreading, densely branched, slow-growing, semi-deciduous tree, usually up to about 10 m tall, but can grow to 20 m high. Bark pale, grey and smooth, when damaged with milky latex. Young branches slightly hairy. Leaves ovate to linear-ovate, the base truncate to heart-shaped, 130–160 × 40–55 mm, blade dull green, leathery. The leaf margin is entire, often wavy in young plants. The petiole is 10–40 mm long; the leaf tip is pointed to acuminate. The leaf stipules are about 5 mm long, soon deciduous. Fruits without stalks, rounded and about 8 mm in diameter, somewhat warty, light green, becoming reddish to reddish brown when ripe. Fruits ripen from spring to summer. The Namaqua fig is widespread and fairly common and, therefore, given a status of Least Concern (LC) on the Red List of South African plants. Widespread in semi-arid to arid regions of the western parts of South Africa, Namibia and southern Angola, from Worcester in the Western Cape, also following the Orange River and adjacent territory inland as far as, just west of Kimberley. It grows in Succulent- and Nama-Karoo Biomes and to a lesser extent in dry Fynbos in the Olifants River Valley (Citrusdal, Clanwilliam). Its habitat is exclusively rock faces, boulders and granite domes. Seed germinates in crevices and the wandering, adventitious roots enables it to form a network of roots. The roots enter hairline cracks and with pressure, enables the tree to alter its habitat. It has been recorded on various geological formations, such as granite, quartzitic sandstone, limestone and banded ironstone. Ficus cordata shares its habitat in Namaqualand with F. ilicina, the latter a spreading rock hugger, with dark green leaves. The botanical name Ficus according to Clark and Charters (2016), is probably derived from the Hebrew ‘fag’ or Persian ‘fica’. The generic name Ficus was established by Carl Linnaeus in 1753. The specific name cordata is derived from the Latin cor, meaning ‘heart’, pertaining to the heart-shaped leaves. Ficus consists of about 850 species, most of which grow in the tropics and subtropical parts of the world. It belongs to the mulberry family, Moraceae, which includes 37 genera and about 1 180 species (Christenhusz 2017). This family has a wide distribution, but more so in the tropics. Ficus (Latin name for fig) is the largest genus within the Moraceae family. It is one of 26 indigenous fig species in South Africa and Namibia (about 250 in Africa), of which most are trees. 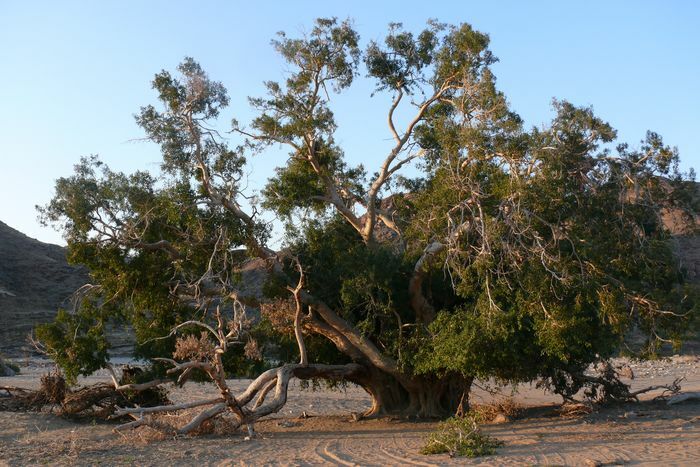 Ficus cordata was one of the earliest trees encountered and drawn by the artist Heinrich Claudius in 1685, who joined the Simon van der Stel expedition from Table Bay to the copper fields in Namaqualand, near Springbok. Burchell also found the tree near the source of the Kuruman River of which he made a sketch of the tree on 14 Dec. 1811 (Palmer & Pitman 1972). Closest to Cape Town, there is a large stand of mature Namaqua figs at the warm water resort ‘The Baths’, south of Citrusdal, in the Western Cape. Trees benefit from the warm water at the source of the spring, as well as the heated stream running down the kloof, where many magnificent specimens can be seen. 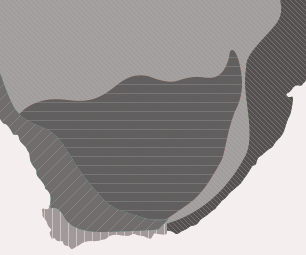 The largest specimen recorded is on the farm Hom, near Abbassas, on the south bank of the Orange River in Bushmanland, Northern Cape, South Africa (see figure) (Van Jaarsveld 1983). This tree is 15 m high with a crown spread of 32.5 m and at breast height the stem measured 4.78 m, measured by Venter & Beukes (1989). This is quite an unusual habitat for Ficus cordata which is usually confined to rock boulders, but at this location, a rocky ridge might be expected below the soil level. Occasionally flooding of the Orange River brings good soil and silt and perhaps the main reason this tree has grown to its present size. 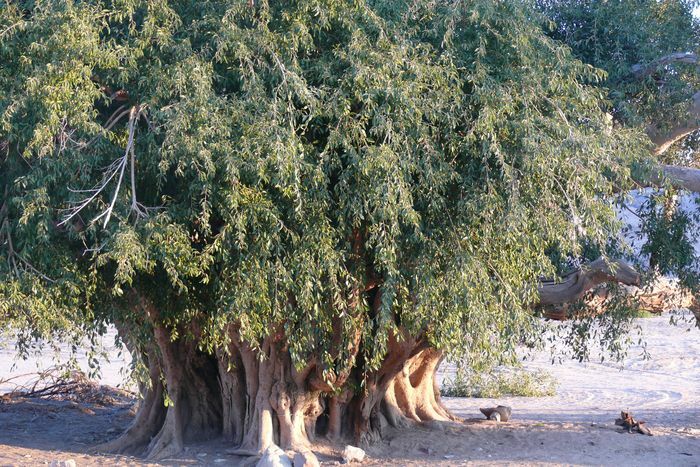 Ficus cordata is closely related to the Wonderboom fig, Ficus salicifolia from the northeastern parts of South Africa. It is immediately separated by the figs, which are stalked in F. salicifolia. Seed germinating in crevices, especially on cliffs, have the advantage of being out of reach of many herbivores. The plant also benefits by the wandering roots penetrating deep crevices, where moisture is obtained. In Namaqualand it is exclusively found on granite domes and sandstone outcrops. Plants benefit the extra moisture from water running down to the base of the outcrops. 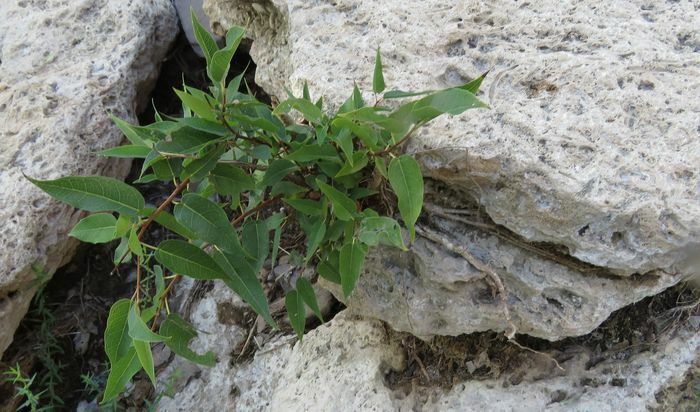 Seedlings in crevices have an extensive root system, often growing over rocks to the bottom of the boulders. The plant initially grows from a semi-succulent caudex in a rock crack, this enables the plant to gradually increase in size, eventually allowing the plant to grow sufficient adventitious roots reaching new territory and deep rooting within the rock cracks, enabling it to grow bigger. If not, the plant can survive as a natural ‘bonsai’ growth. Roots often form an extensive network over the rocks. Namaqua figs have been recorded from various geological formations, including granite, sandstone, dolomite, limestone and banded ironstone. Ficus cordata is frost sensitive, and in higher lying areas of its habitat, the damage can be seen when the plants become pruned back against the rocks. The Namaqua fig is pollinated by the minute wasp, Platyscapa desertorum Compton (Burrows & Burrows 2003). The milky latex so characteristic in most figs, is a protective alkaline sticky sap sealing its wounds. Fruits are dispersed by fruit-eating birds; also by baboons. The colourful Augrabies flat lizard (Platysaurus broadleyi) is also fond of the fruits (Burrows & Burrows 2003). Large groups of this social lizard can be seen along the rocky gorge at Augrabies Falls, where Ficus cordata is not uncommon. These lizards also play a role in dispersing the seed to crevices where it can germinate (Branch 1998; Greef & Whiting 1999). Leaves are browsed by livestock and local game and smaller animals, such as the dassie (Procavia capensis). Occasionally propagated and cultivated and used as a bonsai subject. In northwest Namibia, the bark is used to tan leather (Le Roux & Muller 2009). The Namaqua fig is well-suited for dry Succulent Karoo gardens, in areas where frost is not too severe (Van Jaarsveld 2010). It is a slow grower, and ideal for rocky gardens. It can grow into a large tree depending on the conditions. Several attempts have been made cultivating it out of doors at the Kirstenbosch National Botanical Garden, but plants hardly grow and usually succumb to rot because of the cool, wet conditions on the southeastern slopes of Table Mountain. However, it was grown with success among the gabions (rectangular wire baskets filled with aggregate) in the Kirstenbosch nursery area, as well as in the Botanical Society Conservatory. It will, however, grow well in the Cape Town City bowl, or the hotter and dryer western slopes, in areas such as Bakoven and Llandudno. Best to plant among rocks. Ficus cordata also can be transplanted with ease during the late winter. Propagation is from seed or cuttings or pole cuttings. Crush the dried fruits and sow in spring or summer, in shallow trays. Cover with a thin layer of sand (1–2 mm thick) and keep moist. Germination is rapid with viable seed, and the figs initially grow quite fast. Plant out when large enough to handle (Van Jaarsveld 1983, 2010). Vegetative propagation is also achieved by either semi-hardwood, hardwood or pole cuttings. Semi-hardwood cuttings of about 10–15 cm long can be made in summer. Remove the leaves on the lower half of the stems and plant in a mixture of polystyrene and peat. Rooting in a hot bed is within 2–3 weeks. Pole cuttings can be a side branch of the tree. Plant half of its length in a hole well prepared with a sandy mixture, where compost can be added. Best to achieve this in later winter or spring. Keep moist. Branch, B. 1998. Field guide to snakes and other reptiles of southern Africa. Struik. Cape Town. Greef, J.M. & Whiting, M.J. 1999. Dispersal of Namaqua Fig (Ficus cordata) seeds by the Augrabies Flat Lizard (Platysaurus broadleyi). 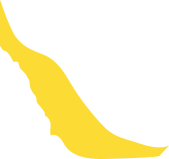 Journal of Herpetology 33, 2: 330–334. Venter, J. & Beukes, G.J. 1989. ‘N reuse Namakwavy. Journal of Dendrology 12: 25–26. Wijnands, D.O., Wilson, M.L. & Toussaint van Hove, T. Jan Commelin’s Monograph on Cape Flora. University of Stellenbosch Printers, Stellenbosch.